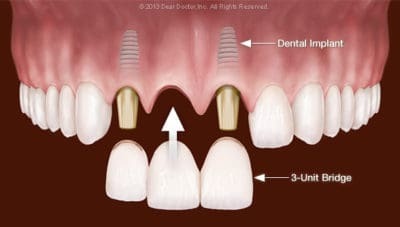 Now that you know how dental implants work, we can talk about the options available and which one may be the right fit for your specific needs. Many people encounter a situation where they lose a single tooth due to an accident, extensive decay, infection, or periodontal disease. A single tooth implant replaces both the root and tooth while not harming your surrounding teeth. At Riverview Dental Designs, we take great pride in ensuring that your dental implant looks natural and fits perfectly with your existing smile. 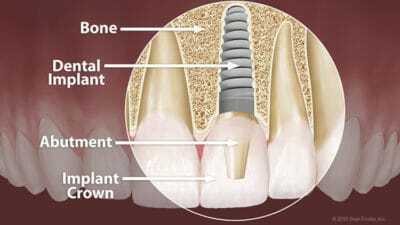 Some patients may need more than one dental implant as a result of multiple missing teeth. 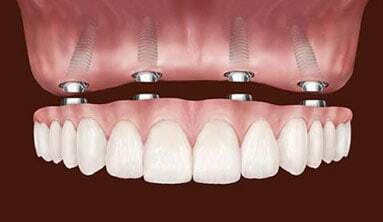 Dental implant-supported crowns and bridges can be used for replacing these missing teeth. These options will replace your missing teeth without relying on support from your surrounding natural teeth, which often compromises the health of those teeth. They will also look and feel like your natural teeth. Because dental implants integrate with your own jawbone, your bone structure is preserved and a healthy smile can be maintained. If you are missing all of your teeth (top, bottom, or both), implant-retained (also called implant-supported) dentures are a great option for restoring your smile and function. They are long-lasting, comfortable, and more of a permanent option than a conventional denture for replacing all of your missing teeth. Implant-retained dentures are fabricated to feel and look like natural teeth when eating, talking, and smiling. Now that you know how dental implants work and what options are available, call our office to set up a complimentary implant consultation.